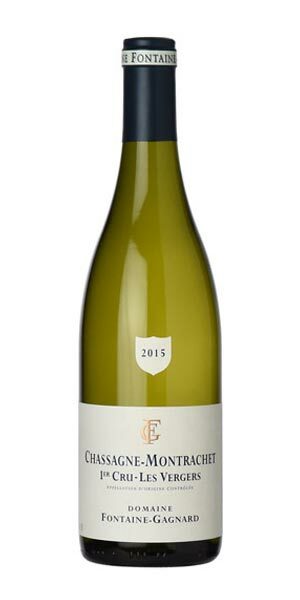 The historic Domaine Fontaine-Gagnard has its origin in the fine Gagnard-Delagrange holdings of fifty years ago, as the vineyards hail from the marriage of Richard Fontaine to Jacques Gagnard’s oldest daughter Laurence Gagnard in 1982. Today, the domaine is managed by the intuitive and graceful Céline Fontaine. The heart and soul of the domaine are their Chassagne-Montrachets, of which they own a fine clutch of premier crus and vines also in the grand crus of Criots-Bâtard-Montrachet, Bâtard-Montrachet and Montrachet itself. The style of the wines is intense, deep and complex. They are Chassagnes that start out life as classically balanced and accessible, but always with fine expressions of terroir and the underlying structure to age gracefully as well. The Chardonnay grapes for the Chassagne “Maltroie” are sourced from a southeast facing mid-slope at an altitude of 240-255m. Maltroie presents one of Chassagne’s most complex soil compositions. Small rocks sit atop a fairly deep vein of mineral clay, rich in magnesium and iron oxide, with vines penetrating to a solid bedrock core of limestone. Lutte raisonnee viticulture and traditional fermentation in barrel with 12 months ageing in 30% new.